The trig point on the edge of the escarpment. At 317m (just over 1000ft) above sea level, this is a great spot to survey the valley stretching out below. But it comes as a surprise to many that this is not the highest spot on Cleeve Hill. There is a second trig point, beyond the radio masts, that is 13m higher and is officially the 'top of the Cotswolds'. 'The Twins' are two wind-swept beech trees on the southern end of the Common, overlooking Cheltenham and Gloucester. Whatever the weather, this is a spectacular spot. 'The Single Beech' is the highest tree in the Cotswolds also at 317m. There is a fine 360 degree view from here and you can really appreciate the open aspects of this hilltop landscape. The Memorial Wall surrounds the tree, with plaques in memory of those who have been particularly fond of Cleeve Common. This is one of some 35 hillforts spread along the Cotswold escarpment. It dates from around 500 BC and was probably built initially as a single bank and ditch, with the second ring added some two centuries later. Why was it built? Like many castles that followed centuries later, it was probably a symbol of power and wealth as much as a defensive construction. Sitting on the edge of the escarpment, it would be visible for miles around and was perhaps the seat of a local chieftain. Much of the hillfort has been destroyed through quarrying in the last 300 years. Today it encloses some 3 acres and is approximately one third of a circle. We simply do not know whether it was once a complete circle, or stopped along the original natural edge of the scarp. 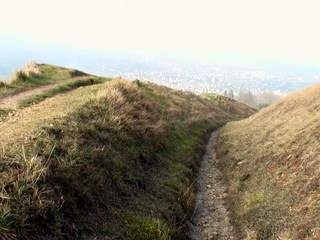 Work in 2011 to stabilize the edges of the hillfort mounds required removal and replacement of some of the topsoil. Interestingly, this revealed a stone structure forming the core of these banks: they are not simply mounds of earth (this stonework is no longer visible). Probably the oldest archaeological feature of the Common, the Cross Dyke is a long ditch and bank earthwork. It runs from near the top of Rising Sun Lane diagonally up the escarpment, over the edge and then swings left into Dry Bottom and Postlip Quarries. This linear earthwork was built as a territorial boundary and is thought to date from the Bronze Age (before 700 BC), hence it pre-dates the Iron Age hillfort. It provides evidence that even this long ago, dwellers in the vale at the foot of the scarp had staked their claim to a large part of the hilltop. Many centuries later, it became the manorial boundary between Southam and Cleeve. Today's parish boundary between Southam and Woodmancote still follows this historic line. ‘The Ring’ is a circular earthwork on the upper part of the scarp slope, some 50 metres in diameter. It is believed to have been built as an enclosure for animals in the Romano-British period (the early centuries AD) and provides clear evidence of the use of the Common as pasture at the time. At the foot of the cliff below 'The Twins' (a prominent pair of trees at the top of the escarpment) there is a square stone block known as ‘Huddlestone’s Table’. Legend has it that this marks the spot where Kenulf, the Saxon king of Mercia, bade farewell to several important guests, including the king of Kent, after dedicating the great Benedictine Abbey in Winchcombe in 811. Although a fine spot for such a parting, it does not lie on tracks in use at that time and, in any case, the Huddlestone family did not move to Southam until the 1520s! Built in 1897, the Washpool is a deep, keyhole-shaped trough with stone sides. It is a reminder of the importance of Cleeve Common to sheep farming in the past. Photographs from the 1920s and 30s show temporary pens containing hundreds of sheep, gathered for dipping. They were herded into the round well and, once thoroughly soaked, allowed to scramble out up the narrow ramp (the fence in the photograph is a recent addition for safety). The Washpool was fed with water from the pond immediately above it, formed by damming the stream that flows down from a spring about 200 metres up the valley which is known, appropriately, as 'Watery Bottom'. The dewpond is a historic watering hole on the hilltop part of the Common, near the radio masts. It was restored in 2000 as an experiment in a traditional way of providing drinking water for grazing stock. The pond is some 20 metres across and 2 metres deep (although the maximum water depth is only about 1 metre). It collects rainwater and run-off from the surrounding land. Traditionally a lining of clay prevented the water from soaking away, but in this modern restoration a butyl sheet liner is used instead. The dewpond has provided a source of water not only for sheep, but also for wildlife on the Hill and is visited by a wide range of birds. Cattle have been kept out for fear of damaging the lining. So far, it has never dried up, even in dry summers. However, on one occasion it had to be pumped almost dry by the Fire Brigade – who were called in to rescue goldfish that had been dumped in the pond! More on the Dewpond. At Rolling Bank Quarry, you will find an interpretation board telling you about the underlying geology of Cleeve Hill. This was installed by the Gloucestershire Geology Trust, who have also produced an illustrated geology trail guide. Rolling Bank Quarry is situated near the top of the escarpment, along from the Golf Clubhouse and directly behind the 18th tee.